I host Easter for the family. This is my third one in the row, fourth total. A friend asks every year if I still host and then says in amusement: "A Jewish girl hosting Easter, how interesting!" The first time I hosted Easter was because I got a new holidays cookbook and Easter looked so pretty I wanted our Easter to look just as the pretty pictures. Well, we live in the Midwest. Cookbook photos are shot in sunny Cali, where one can have an Easter egg hunt on fresh green grass between colorful tulips and chirping birds. Everyone's in pretty Easter outfits made of linen with bare arms and tan legs. We get bone-chilling winds, dead grass, trees still in slumber, and everything covered in a thin layer of winter slime that takes a week of rain to wash off. The egg hunt has to be conducted indoors. Totally not what I envisioned. Not to mention, the date moves around every year, it's impossible to plan around it. They nailed Christmas to the same date every year even though that's not His actual birthdate, why can't they do the same with Easter? I found out I was pregnant when I did the first Easter. My mother-in-law asked that perhaps I shouldn't do it, but I was determined to Martha Stewart it out. Then the morning sickness rolled in. I had to cut everything while sitting down at the kitchen table (my chef cutting techniques not working while sitting) and I barely managed to hold it together as I marinated pounds of raw chicken breasts. The next day I couldn't eat anything I cooked, and my husband decided to announce to his siblings that I was pregnant. After congratulatory hugs and kisses, and asking me how I felt, my sister-in-law exclaimed "and you did Easter!" As soon as everyone left that evening, I tossed my high heels, plopped on the couch, and swore off cooking for the rest of the pregnancy. And I left cleaning up to my husband. When I resumed my Easter hosting duties, I was intent on making it a top notch event. I pulled out my vintage silver platters (and spent a whole week polishing), ordered a Boar's Head ham from an Italian butcher, served tiny finger foods cut into perfect squares and piped out my deviled eggs filling (I still pipe it out, what am I supposed to use: a spoon?) I even served french toast made from Challah bread which I had to import from a North Shore grocery store because it's not sold in Western Suburbs. With mascarpone cheese and fruit on the side, of course. We made a huge pitcher of Bloody Marys from scratch and I had a multilevel desert table. We ended up with tons of leftovers, Bloody Mary went unused, sink got clogged and the garbage disposer exploded. Literally. All over the kitchen floor. It was suggested that perhaps next year the menu should be toned down a bit. Second time around – the silver stayed put and potato chips graced the bar. But my huge platter of crudites with a homemade blue-cheese dip went untouched. Scratch that off the next year's menu. The Waldorf Salad did disappear, but it's not something one would serve every year. At least we had an unusually warm spring and my landscaping looked pretty and in bloom for the first time ever. This year no raw perfectly lined up dippable veggies. And since Easter was in March, I decided to Irish it out. Before we took over the Easter duties, we used to host a lovely sitdown St. Patrick's Day dinner for 10-12 of our closest friends who happen to be Italian from New Jersey. White tablecloth, china, ironed cloth napkins and everything. And I peeled 10 lbs of potatoes for that too. Not a single leftover. Wine and Guinness flowed. I take full credit for introducing the Italians to corned beef and cabbage. I miss that. Still determined to have it my way, I designed a menu of corned beef, potatoes, green beens with bacon and white balsamic, caprese appetizers, cheese and cold cuts platters, strawberry and spinach salad, sardine spread crostini, and piped deviled eggs of course. A smocked salmon platter just for my son and my mom. Out of fear that the reheated corned beef might get chewy (it has a tendency to do that since it is a very tough part of cow to begin with, thus it is corned) I made a honey-mustard sauce. Which I served in a silver gravy boat. I hate other cooks in my kitchen so I try to limit food contributions to a minimum. My sister-in-law does make killer cucumber sandwiches though so they're always a welcome must. And they come already plated on a gorgeous tray of course. Other than her, stay out of my kitchen. The defiant potatoes were devoured (they were gone before I was able to snap a picture for posterity). I cooked them with tiny heirloom whole tomatoes just for my dad to enjoy. I ended up with most of the green beans left over. About 4 lbs worth. Scratch the beans off the next year's menu. And I'll only be deviling 6 eggs, because that's how many was eaten. Remember, they're cut in half so a dozen is 24 pieces. My father asked how come there is no chicken. Adding chicken to the menu now. My mom makes this yummy chicken cutlet rolls and she gets not only Amish-raised organic chicken but it's also Kosher. I think it'll go nicely with Italian butcher's ham. Perhaps the Challah french toast should make a reappearance. Maybe I'll get lucky and find the bread here this time. 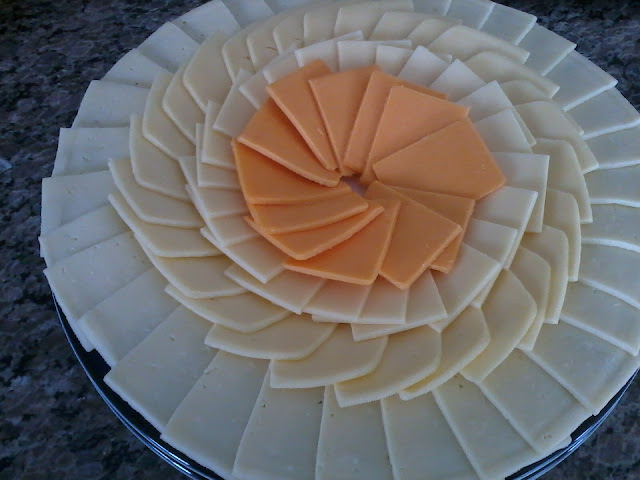 Extremely proud of my cheese fanning technique. The traditional chips and dip (one knows you've been married since late 90s if you have this wood Crate&Barrel chip-n-dip in your house) and our pride and joy Beertender. 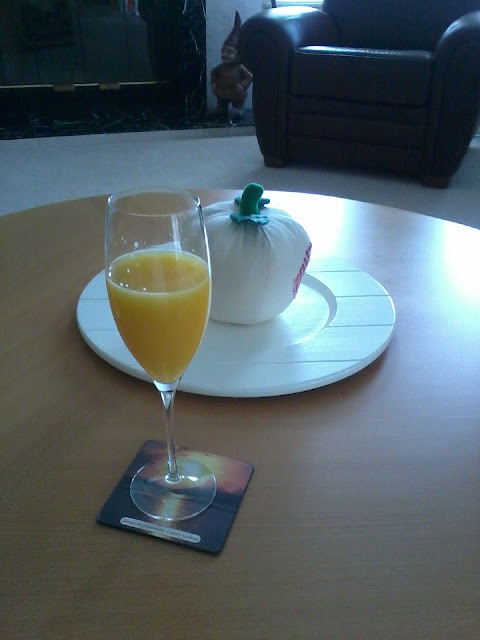 The only way to start off the Easter day right is with a Mimosa.